As you probably noticed, there is no mention of numbers in fans or followers in the Model on the right. In social media there are lots of discussions about efficiency and ROI. These are all valid because it isn't quite obvious where the ROI of Social media is nor how it should be measured. The average social media user just sees one metric: the amount of followers, fans or connections. These however are 'vanity' metrics, they tell us something of the status, but it has nothing to do with Impact. 'Impact' is something else. To explain this, it is sometimes best to just relate to real time situations instead of using online social media examples which most find hard to understand. Imagine that you are in a forest and you shout out your message. The chance that anyone hears you is remote, just because no-one is listening. If you do the same at an average marketplace, with lots of people present, chances are that people will hear you. At the same time this audience will be annoyed because you are imposing yourself upon them with a message that bears no meaning to them directly. Soon you will come to the conclusions that you have to have a large audience and a willing public to listen to you. Furthermore your message must be relevant to this audience. The mentioned marketplace thus isn't the best place to be, you would rather be on a meeting where there are only people who share a common interest. Targeting the right group of people with a relevant message is the first step. Next is that the group will regard you a specialist in your field, you'll have to have authority. You already learned that can never have any authority on the general marketplace, there you are just an annoying ‘shout-out’. 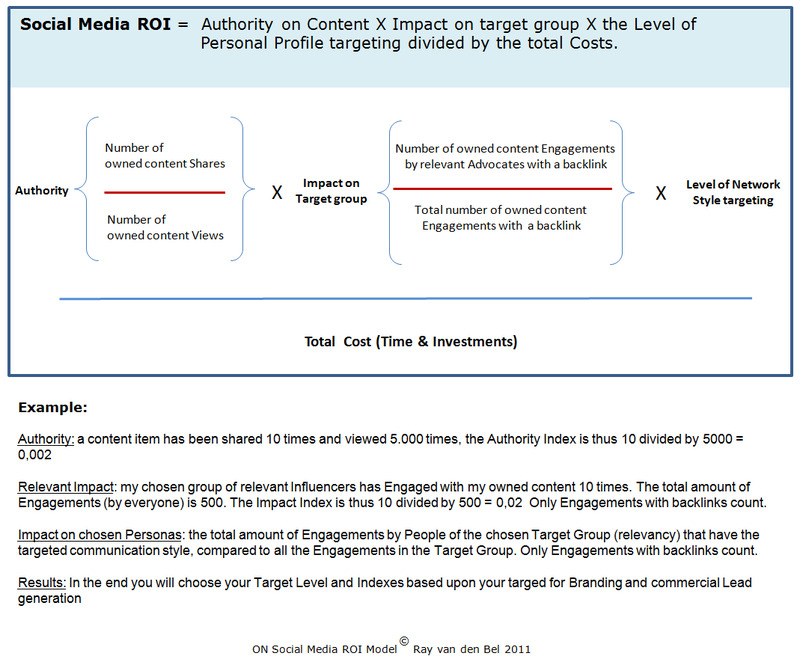 So the message of this example is: don't measure followers and fans, measure Impact. In online media you can see this happening as well. You could ask yourself Who is really influential? But then you should ask yourself as well; am I asking the right question? Every social media portal and every social media analytics tool seems to want to give an answer to the question of 'who' is influential, but frankly I believe it is the wrong question. Someone with just 40 followers on Twitter could also be a highly respected journalist writing about finance in a major daily newspaper. These influencers have an authority which isn't directly social media related. Their authority is cross-media, perhaps traditional, but very visible. You could argue that anything these influencers say have a high Impact, yet it is just a factor of what is being said. After all if the article itself isn't any good, no-one would read it, let alone share it. So that is the reason why the impact of the content itself is the Leading factor, not the person telling it,tor the media being used. These are just variables and should be treated accordingly. It is very well understandable that Social Media networks are focused around the person instead of the content. People are Their engine towards more engagement. They are the ones that can 'invite' more people to the network and thus to the commercial target of the social network. Yet, from Your point of view, is it the best metric? If you are working for a company and you would like to measure your company's impact in social media, wouldn't it be more interesting to calculate the impact of your message instead of your accounts? After all, your message can be anywhere, on any portal, using every kind of communication vehicle. Finally, be aware that fans and followers can be bought using tools, click-farms, advertisements or can be generated by simply using the right tricks. They have only very limited value. So therefore, please try to focus on true impact and true influencers instead of merely counting 'fans' and 'followers'. So now you have some insight in what to look for, but how can you measure it? These also consist of many variables that have to be calculated trying to find the impact of a message. We all know that in real life a message can be more influential if it is being told before the right, targeted audience. Also the person telling it should have authority for this audience and the message itself should be at least 'interesting'. These (targeting, authority, value) all are important factors, but they aren't the only ones. Imagine that you are attending a meeting for professionals where a 'high authority speaker' gives a lecture. We all know that part of the Value of the meeting is networking with other people as well, preferably with the high authority Speaker. If we want have some influence ourselves, it can be interesting to find the right moment and try to talk one-on-one to the person. Maybe we can influence the Influencers' ideas with our own message and thus use his authority for our own benefit. This is a situation we all know and it is also happening in social media. All too often I see that people with high authority are getting comments on their posting, just to notify the authority in a certain field of their existence, trying to get closer to the person with authority. This form of engagement is quite common. Indeed it also has value for the authority because every action, every comment, share, like etc. adds to their online visibility and thus business. I am telling you this little story just to make you aware of the true value of Engagement: trying to calculate engagement by just adding the numbers and valuing them equally thus isn't the best method to calculate impact. Engagement is a matter efficiency and equality, not for the person having authority, but for Yourself. So please refrain from meaningless interactions towards e.g. photo's of the breakfast of a person with authority, it will not get you anywhere, you are just another 'number' in a SEO metric for the authority and you are showing you are indeed a ‘follower’ but no Leader.. Engagement is a matter of true interaction and for that to happen, you should seek an one-on-one situation and tell your message in such way that it has Impact. This is the reason that over the past few years I did quite some extensive research in online engagement. Where is the true Value? One thing I found out is that the way we tell something to the other person is very important. Image being at the same meeting. We all have been in a situation where someone is trying to talk to you and you instantly know that you want to be polite but keep the conversation as short as possible. You are already looking for the toilet sign trying to find an excuse to escape.. This happens because of 2 reasons: we find the other person instantly unappealing. That has to do with communication styles. Some people are e.g. very expressive. They tend to simplify everything they discuss towards being 'wonderful or useless', 'superb or horrible', but nothing in between. Now if you are a person who is more inclined to discuss the area 'in between', the finer shades of gray, this could instantly turn you off. So the way the story is being told is important. It not only has to have value to us, it has to match our personal communication style. On OpenNetworkers.info I have added general information about the ON Model giving you a bit more insight about the mechanics. In social media there is a metric which is generally being called 'Sentiment'. In general discussions are measured towards 'positive' or 'negative' sentiment with some shades of grey in social media analytics tools such as Radian6, Sysomos or Alterian. Hopefully you can already understand the limitations of such a metrics if you don't know the context of of where and how a discussion can be held. Twitter e.g. is pretty much useless in this respect because there is a strict limitation of 140 characters. It only leaves very expressive short messages which probably aren't representing your true communication style. Google+ on the other hand is enabling full length discussions which leaves more space to add the finer shades of gray. The other reason has nothing to do with social media, it is purely a communication technique. Some people are seeking engagements in which they don't seek the right level towards their partner. E.g. we all know that most people are somewhat reluctant, hesitant or even afraid of talking on the same level with a celebrity. The celebrity has a high status for most of us. Conversations between a person with a high status and a person reacting towards that status have an unequal level and thus never have a high impact. Whereas, if we act upon ourselves, regarding ourselves as a person with the same value (although maybe in a different field) as the celebrity, we get a more balanced engagement and thus a higher impact. This general rule also applies for Social media. It also the reason why on Opennetworkers.info we are trying to promote personal branding towards personal passion. It makes people stronger, more willing to accept the concept of equality towards anyone, even the celebrity and thus more successful in life. But how can we use this experience in social media? How can we translate that knowledge to a workable metric for the impact of Engagement? In my opinion the answer lies in new initiatives which are being developed such as APML.org and the mash-up of conservative CRM data with social media data. Well that sounds complex, even to me I must admit, so let me try to explain. Online we are doing a lot of things, we engage in social media, add our profiles, use the internet for searching, Google-ing all sorts of content trying to get answers, buying items, joining events etc. All this information about us can and will be used to not just form an idea about where our interest lies, but also how we Engage online. If our general engagement is being done by using lengthy, but in-depth discussion and focusing more on e.g. Google+ than on Twitter, we can presume that the person in question is more likely to have an 'Advisor' communication style than an Expressive communication style. It gives us the added value of adding more Value to our engagement concerning 'how' we interact. Indeed such information can even be used in selecting who we would like to Engage with. Having the knowledge of predicting a misfit in a one-on-one discussion in advance gives us the possibility to refrain from the engagement or to leave it to someone else who has a better fit to the communication style of that person, thus having a better chance of influencing. It saves us Time, the final metric I would like to introduce. You probably know that feeling that some meetings were just a waste of time. Somewhere along the line there clearly hasn't been enough value to you with respect to the metrics I discussed: relevancy, authority and added value by one-on-one engagement. So 'Time spend' is important, as an metric. In social media we can witness use wastes of time: irrelevant discussions, untrue engagements, building quantity in fans and followers just to name a few. If you have read the entire article above you probably have some idea what the direction should be if you are trying to build a professional business around your social media activities. Now let me explain the Model itself a bit further. As you noticed, the Authority of the content is important. I regard it as the sum and a reflection of the authority of the content writer, the popularity of the website or the popularity of the media network used. These are all variables with their own pitfalls and that is why I choose a simplification in which traditional Webanalytics (Google Analytics, Omniture) metrics and social media (Radioan6, Sysomos) metrics are being used to calculate Authority. Likewise I calculate the Impact on targeted audiences by dividing the number of relevant audience Engagements by the total amount of Engagements. A s I explained, a lot of engagements are not relevant, important or are a projection of people who are not engaging on the right level. I wanted to filter these out by focusing on the number of Engagements by relevant advocates, knowing that this group is generally higher in hierarchy and thus more willing or able to engage at a shared level. Furthermore, the requirement of a backlink to the owned content ensures that irrelevant 'chit-chat' gets counted.